After seven months of preparation National Danish Performance Team is ready for a six-month long World Tour of 12 countries, presenting 125 shows and 160 workshops. South Korea, Indonesia, Argentina and USA: that’s only one third of the countries on the NDPT tour plan which starts on Monday 29 September. The goal is to move the world through gymnastics with the mindset of ‘sport for all – sport for life – and sport for fun’. The team will return to Denmark in April 2015 to do 22 shows on its home ground. “We try to inspire children, young people and adults to a healthy lifestyle by showing our joy of movement. Gymnastics is our tool to get close to people, give them a unique experience and show that they can live an active life as well,” says Torben Nielsen, Team Manager of NDPT. During the World Tour the team will be Take to Thaiwan with a tai chi-inspired dance and will do workshops in areas in New Orleans that were hit by hurricane Katrina in 2005. In addition the team will conduct plenty of workshops at schools and universities in all 12 countries. The 28 gymnasts in National Danish Performance team are is among the best in Denmark and were selected for the team in February after a tough draft with 147 applicants tested for their gymnastic level, physical strength and personality. Since then the gymnasts have prepared for their gymnastic adventure with plenty of physical and technical training resulting in more than 500 hours of training during the training camp in July and August. NDPT has just finished its TAKE OFF TOUR with the show ORBITA and more than 16.000 spectators in Denmark and is now ready to tour the world. In addition to impressing audiences with their gymnastics skills, the 28 gymnasts will also experience many cultural encounters during the World Tour. 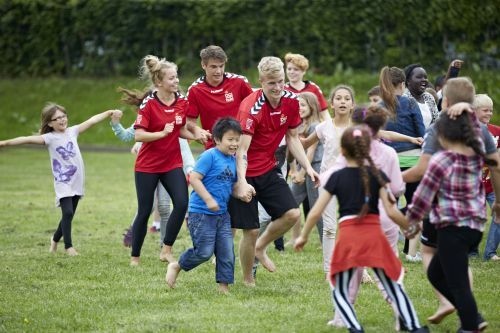 Host families will arrange accommodation several places, and as the sharing of movement and ideas is reciprocal NDPT will bring back a lot of inspiration to Danish gymnastics. NDPT consists of 28 gymnasts – 14 women and 14 men – ageing 18-28. The profit from shows is earmarked to inspire people of all ages to a healthy and active lifestyle all over the world with 160 workshops and 125 shows.